Ngāruawāhia (pop. 5,106 is a town in the Waikato region of the North Island of New Zealand. The meaning of the town's name is open the food pits, which comes from a feast held hundreds of years ago to celebrate the coming together of two tribes through a marriage. The word combines the Māori words wahia meaning firewood and rua meaning pit or hole in this usage. Ngāruawāhia is located 20 km north-west of Hamilton at the confluence of the Waikato and Waipa Rivers. After the Invasion of the Waikato in 1863 by British imperial forces the town was re-named Newcastle, but reverted to Ngāruawāhia soon after. Ngāruawāhia is home to the Māori Kīngitanga or King Movement. This was the official residence of the late Maori Queen, Te Arikinui Dame Te Atairangikaahu. Tūrangawaewae Marae is on the eastern bank of the Waikato River in Ngāruawāhia. Several Music festivals have been held near the town, the first in 1970, and a series from 1979 onwards. A train derailed on 14 March 1998 after a load moved in transit and then struck a through-truck bridge. 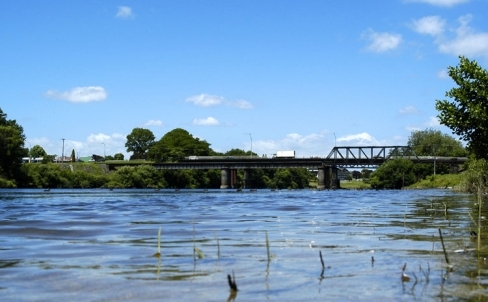 The wagons piled high on the superstructure of the Waikato River Bridge, and there was major damage to the bridge. Ngaruawahia United, known as "The Green Machine", is the local football (soccer) club, founded in 1968. As of 2007, it comprised ten junior sides, four senior sides and a women's team. The senior men's team competes in the Northern League Division 1 competition along with its Reserve side. At the beginning of 2008 the Northern League competition was rearranged. This means that Ngaruawahia United has their A team in the Northern League, their B team in the Federation League and their C team in the Waikato League. Ngaruawahia will host Waikato FC of the New Zealand Football Championship for the 2008-09 season. Waikato will play their matches at Centennial Park. Ngaruawahia is the home of the rugby league team Turangawaewae RLC, which is named after the Marae opposite the clubrooms. The club currently holds the record for the first team to ever win consecutive titles in the annual Waicoa Bay Premiers Competition, consisting of all teams in the Waikato, Coast and Bay Of Plenty regions. This information was correct in May 2009. E. & O.E.